World Topographic Map - This global map from GIS experts Esri includes boundaries, cities, water and physiographic features, parks, landmarks, transportation and buildings. Contour lines and hill shading add detail to a map that makes an excellent base on which to plan and showcase your routes. 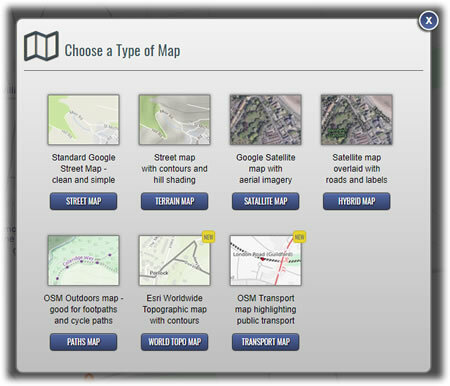 Transport Map - This map uses a custom design built on worldwide OpenStreetMap data, to highlight public transport links. Roads and paths are understated to give prominence to train and bus routes, including bus route numbers where available, making it very useful for planning routes away from home. In addition to adding these two new types of map, we've also made it possible to share routes using any of the available map types, so you can now choose from seven different types of map when plotting and sharing your routes. We hope to add further options in the future. Lastly, we've changed the default map from Google's Street Map to Google's Terrain Map, as this shows more clearly where those all important hills are! It would be nice if the user could choose a defult map setting as I prefer the basic google maps initially then later look at topo. Thanks for the suggestion. Coincidentally someone else just suggested the same thing! I've added it to our Feature Requests list (number 77) - if anyone would like to see this added, please vote for it there.